As we make the final push towards Spring Break I would like to take a few moments to remind our parents of some important dates and events that are fast approaching for Woodhaven Middle School families. As you can see , registration for the upcoming year must be completed by March 22nd, 2019. You can learn more on our website. As you may be aware, Term 2 report cards are available on Friday, March 15th at 3:30 p.m. You can access your child’s report card through your PowerSchool account. If you require any assistance with this, please do not hesitate to contact our school office, where we will be happy to help. Should you wish to have a printed copy of your child’s report card, please just call our office and we will make one available to you. We are excited to be able to meet with our parents and students again to discuss your child’s learning progress. We are holding our Term 2 Parent/Student/Teacher conferences next Wednesday, March 20th and Thursday, March 21st from 4 – 7 p.m.
You can register for an appointment with your child’s teachers on our website. As we are talking about the progress of your child, we strongly encourage you to have your child with you to contribute to the conversation. At Woodhaven Middle School we continually strive to improve upon the good work already happening in our school. It is with this in mind that we would ask you to consider taking just a few minutes to complete the ThoughtExchange survey that Parkland School Division is conducting. Hearing from you is very important to us in our efforts to provide the best possible education and experience for all of our kids. You can learn more about this process and how to access the survey on our website. Thank you for taking your time to learn a bit more about what is happening in our school and for all that you do to contribute to our kids’ success! While our kids students and staff are ready for a well deserved break, there’s been a lot of action at Woodhaven Middle School lately that we want to share with our community. If you’ve been following my twitter feed you have probably seen some of the pictures below. We are proud of the efforts of our staff and students who are participating on one of our 6 Volleyball teams and in our Drama production “High School Musical”. With just these two activities we have over 100 kids engaged in extracurricular opportunities in our school! We couldn’t be more proud of them all! We are also very proud of the citizenship shown by so many of our students who have been going throughout our community as part of their Woodhaven Connects projects to give back. Below you see a group of students singing Christmas Carols to families in our area. You can see more pictures and a video of the Christmas Caroling on Ms. Butler’s twitter feed. 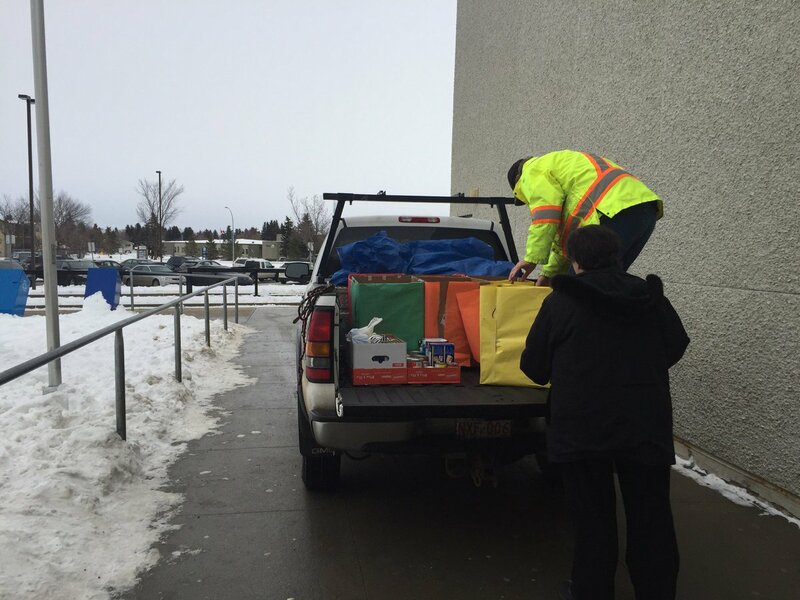 Not to be overlooked, our students and families supported the Spruce Grove Kinnette’s Hamper drive, filling a truck two times with all of the food and gifts they brought in! There’s lots more happening, like our grade 9 students volunteering in Inner City Shelters in Edmonton last week and our grade 5 students delivering Christmas cards to residents in our area. I am also looking forward to seeing the reaction of some of our little friends at Brookwood School as our grade 8 students have a Christmas surprise in the works for them too! In the meantime, I would like to take this opportunity on behalf of the staff of Woodhaven Middle School, to wish our families a safe and relaxing holiday season spent with family and friends. It’s been a while since my last check in so I thought I would share a bit about what’s been happening at Woodhaven Middle School . The staff at Woodhaven was extremely proud of our students as we held our annual Remembrance Day Ceremony in our school gym. We are truly appreciative of the parents and Trustee Darlene Clarke who were able to join us for this important event. Check out some of the event in the pictures and video below. Over the past few weeks we’ve had some great Den Days activity and fun. Our Citizenship Ticket initiative led to all of our staff handing out tickets to students who were demonstrating good citizenship within our school throughout the week. We had everything from kids holding doors to cleaning hallways and supporting peers! It was great to see our kids being celebrated for simply being awesome! There was also a bit of fun mixed in for Den Days as our PE team hosted some Den Days intramurals. Check out the video below. Volleyball is winding down but fear not, Basketball is coming soon! Students in grades 5&6 are having a great time as Fall Ball is officially underway. Our awesome PE team, along with some fantastic gr 8&9 volleyball players are teaching the game to our younger students. Not only is this a great opportunity for our younger kids, it’s also an opportunity for our bigger kids to serve as mentors and develop some leadership skills. As has been our tradition, you can’t finish up a volleyball season without a staff vs student game. Lots of fun for everyone… and man those kids are good! We can’t forget about our awesome fine arts program under the leadership of Ms. Young, Ms. Weimer… and Mrs. Schaber who is running art club this year. Keep an eye out for my next blog post which will highlight our awesome kids in these groups.